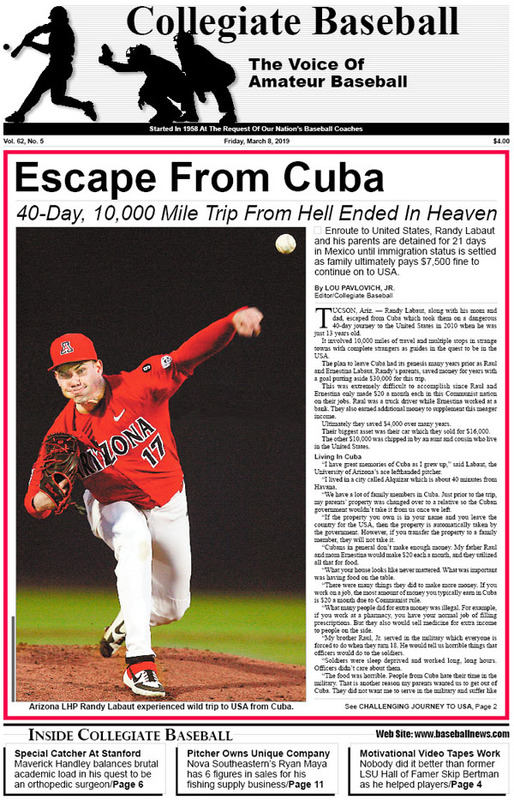 • Escape From Cuba: 40-day, 10,000 mile trip from Hell ended in Heaven for Labaut family. • Ultimate Balancing Act: Stanford catcher prepares to be orthopedic surgeon after baseball and faces huge academic load, including 5-hour labs. • 6 Figures In Sales: Nova Southeastern’s Ryan Maya runs online fishing supply company when he isn’t pitching. • Editorial: With record strikeouts, pitchers have a big edge thanks to higher launch angles by hitters. • Lou Pavlovich Column: Nobody in college baseball history was better at making motivational videos than former LSU Hall of Fame coach Skip Bertman. Here is how he produced those amazing videos for his teams. • Junior College Notes: Santa Fe (FL) pitching staff has fired 2 no-hitters and 9 shutouts over first 19 games while Cochise College (AZ) started off with a superb 15-1 record and 31-inning scoreless streak, plus much more. • Collegiate Baseball’s NCAA Div. I Top 30 Poll Presented By Big League Chew: LSU sits at No. 1 with 7-0 record as Tigers average 10.7 runs per game. • National Players Of The Week Powered By Diamond: Incredible achievements take place across the USA,. including 14 strikeouts by Navy RHP Noah Song as well as Thomas Dillard of Mississippi with 3 home runs and 13 RBI over 4 games, plus much more. • NCAA Div. 3 Notes: Southwestern’s Austin Smith strikes out 16 to kick off 2019 season, Cameron Upton of Gallaudet goes 6-for-6 over two games, plus much more. • High School Notes: Here is a rundown on the major high school tournaments across the USA entering 2019 season. • Justin Dehmer Column: When things go south in game, can upset player simply let it go? • Ruleball With Rich Marazzi: When 2 runners are on same base, consider this. • NCAA Div. 2 Notes: Will Bausinger is first Missouri Southern pitcher to fire perfect game, Florida Southern dedicates John Rodda Stadium at Henley Field, plus much more. • Tony Abbatine On Hitting: Hitting improvement lies in swing, vision models. To purchase the March 8, 2019 edition of Collegiate Baseball or subscribe, CLICK HERE.